Teachers and support staff use a range of techniques to prepare children for learning. 1. Language of good sitting and good listening. 3. Gestures i.e. hands held high copying teacher. 4. Clapping and rhythmic games. ‘Thinking Actively in a Social Context’ is the principle approach for learning that we adopt at Mellor Primary School. 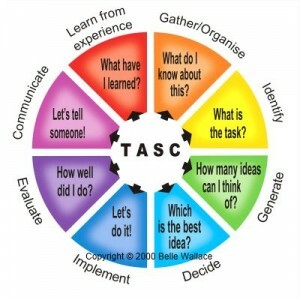 The process: The ‘how’ we engage our children in their learning follows the TASC wheel as developed by Belle Wallace. The wheel is explained clearly in the TASC website http://www.tascwheel.com/. All teaching staff are expected to use the structures established within the wheel both at a Macro level for the curriculum development across a term and within smaller blocks of work or even with lessons. The key aspects of the wheel are outlined below. Teachers can engage their pupils within the wheel at differing points. There is no requirement to follow the wheel for all learning opportunities. This is the starting point of TASC. Pupils bring all relevant previous knowledge about a topic into their working memory. This is the point at which we find out what pupils already know and start to differentiate. There are a number of tools that can be used here, including mapping. At the ‘identify’ stage, pupils ensure that they understand the task they have been given, or they set the parameters of their work. They think about success criteria and ask questions to expand their understanding of the subject. The ‘generate’ phase is creative and open-ended. All ideas about how to fulfil the task are valid. This is the time for right-brained, blue-skies thinking. Groups may also want to do a ‘formal brainstorm’ to gather ideas. ‘Decide’ is a logical, rational, left-brained process quite different to ‘generate’. Pupils could use a number of tools to make rational choices. At the decide stage, pupils are considering factors such as time constraints, available resources, health and safety, as well as whether the idea fulfils the brief. At this stage, pupils make their product, enact their idea or prepare their presentation. Teamwork is a crucial element of this stage. Pupils may work to a structured plan. TASC activities should be ‘Maximum Thinking, Minimum Recording’. Remember, the product is not the point – it’s all about thinking. It is important that pupils are encouraged to take ownership of their learning, not least by being realistic about their achievements and next steps for improvement. Self and peer evaluation are key elements of the TASC process. One of the most motivating influences for pupils is having a real audience to present their learning to. The audience may be within the class, the school, or beyond. Using TASC, we can increase motivation and engagement. The final stage of TASC focuses on metacognition – the ‘thinking about thinking’. Encouraging pupils to reflect upon, and talk about, their learning (what they have learned and how they have learned) greatly enhances the impact of the learning experiences. It is essential that children have concrete experience before progressing to abstract concepts. We always begin by sharing the learning and its purpose (share the big picture). We communicate learning objectives and involve the children in developing success criteria. Click here to see our curriculum planning & class newsletters for 2015-2016.